Why do we need to recycle and what happens to our rubbish after it is taken away? This book reveals the impact we have on our planet and environment and how recycling creates new products such as clothes and stationary. With photographs, colourful illustrations and simple text, this is a straightforward introduction to an important subject. 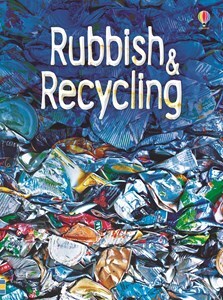 Rubbish and Recycling by Stephanie Turnbull describes and illustrates what happens to the rubbish that we throw away. The book is informative and uses a mixture of text, photographs and illustrations; some of which provide a humorous but nonetheless factual element to the text. The book provides a lot of information that could be used in discussions, and as a resource for specific topic-based activity. My son is currently learning all about recycling. This book has been a tremendous addition to his learning and he has even brought it into school for everyone to see. Colourful pictures and diagrams and easy to understand text make this book ideal for the young (and old!). My son's not quite four yet but he is always asking questions about where waste water goes and what happens to the rubbish that goes into the dustcart. Although this was meant to be a young reader's book, I found it equally valuable to read to him to explain everything he wanted to know in a straightforward and well-illustrated way and to introduce some new ideas like recycling. It may not be a glamorous topic, but it has been an enjoyable read together!